This was perhaps my favorite book from 2009. Written in 1968, during Abbey’s time as a park ranger in Arches National Monument near Moab, Utah, it falls somewhere between Jack Kerouac and Bill Bryson in both style and substance. Abbey is a cranky old coot, railing against civilization, the park service, the government, the tourists and the roads built to bring them into the depths of the parks. But I underlined the heck out of this book. It’s philosophy, environmentalism, natural history, taxonomy, folklore, poetry and angry ranting all in one. Abbey’s sense of humor and sarcasm are endearing, and his environmentalist spirit is inspiring, though dated by some of Abbey’s more hypocritical moments: he has long beautiful passages detailing the beauty of the canyonlands, yet offhandedly mentions rolling an old tire down the slope from the road for the fun of it; and with Luddite fervor, he lambasts the obnoxious presence of ignorant tourists in the park, yet longs to head to the mountains where he can carve his initials into the trunk of a juniper tree. Still, these faults aside, Abbey is a fascinating thinker, and his descriptions of the natural beauty around him are at times stunning. 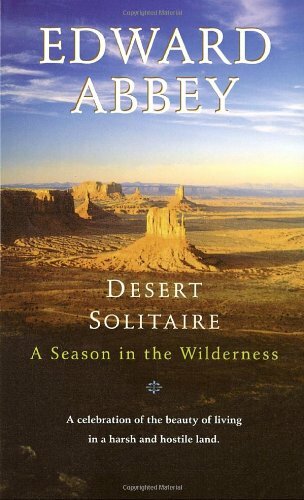 I’ve spent a little time in Joshua Tree and the canyonlands of southern Utah, and reading Abbey’s descriptions made me want to go back and explore them further. And the case he makes for our need to have a wilderness, an “out there” that serves both the few that explore it as well as the many who simply take comfort in knowing that it exists, that we haven’t developed every square inch of our crowded world, is both compelling and, I think, spot on.